Donington became another step in Sarah's learning curve when it presented her with her first wet race in the Clio Cup car. Sarah is really pleased to announce that she now has a 'manager', Val Adaway! Sarah had another successful weekend in the Michelin Clio Cup at Croft last weekend. Sarah was extremely pleased with the progress she made in the first round of the Michelin Clio Cup last weekend at Silverstone. Sarah was interviewed at the beautiful Stapleford Park recently. Sarah went along to the BARC Awards last weekend with Team Westbourne. Sarah was honoured to received the BWRDC Chairman's Trophy at the annual awards & dinner. Sarah attended the Autosport International Show last weekend at the NEC in Birmingham. Sarah changed her type of racing vehicle last month - to a racing P1 Puma RIB! 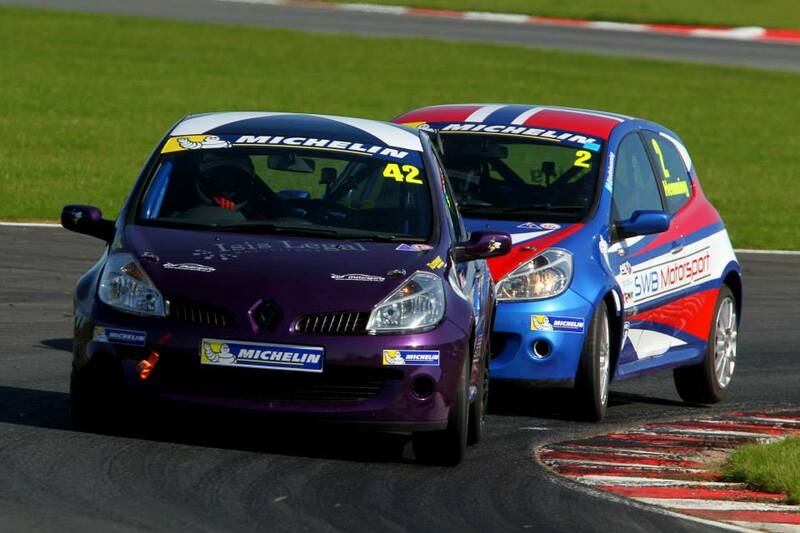 Sarah finished the Michelin Clio Cup 3rd in the Championship after a solid final race at Silverstone. Sarah went on a road trip around France, Switzerland and Italy last month, and took in some famous race tracks en route. Sarah had one of the worst weekends in her racing career this weekend - and it had nothing to do with on track action. Sarah was asked to give a talk at her local library to raise some funds to help with local children's projects. Once again the roller coaster of motorsport continues! New Strategic Partner for 2016! Sarah is really pleased to announce a new strategic partnership with Corporate Motion for the rest of the 2016 season. Sarah was honoured to be invited to the 'Salute to Women in Motorsport' event held at the prestigious Royal Automobile Club in Pall Mall. Rockingham, Sarah's home circuit proved to be full of ups and downs. Pembrey was a good weekend as far as pace was concerned, but the win eluded Sarah. Sarah took a double win at the first round of the Michelin Clio Cup at Oulton Park. Sarah attended the BARC Awards with Westbourne Motorsport. Sarah attended the launch of the new collections at the British Motor Museum at Gaydon. Sarah attended the awards dinner of the British Women Racing Drivers Club on the 6th February. Sarah had a final foray at Snetterton for a Time Attack Race at the beginning of November. It was the usual roller coaster ride for Sarah in the final round of the Michelin Clio Cup at Silverstone. The fifth round of the Michelin Clio Cup was a bit of a rollercoaster ride for Sarah. 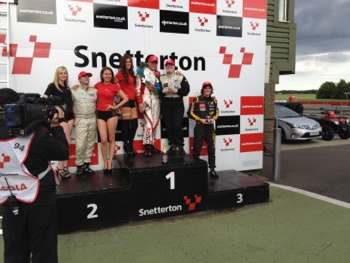 Sarah achieved a double podium at Croft despite a disastrous qualifying. Sarah had a solid start to her 2015 racing campaign at Rockingham at the weekend, despite some initial hurdles! Sarah attended at the CDCC awards evening last weekend. Sarah won a heat and the final race of the day - but not quite what you'd expect! Sarah was showcased as Downforce Radio's 'Driver of the Day' last week. Sarah was part of the first 'Here Come the Girls' radio show on Downforce Radio. Sarah is to become a regular panellist on Downforce Radio in 2015. Sarah had a busy time at Autosport International. Sarah took a historic victory at Silverstone at the weekend. 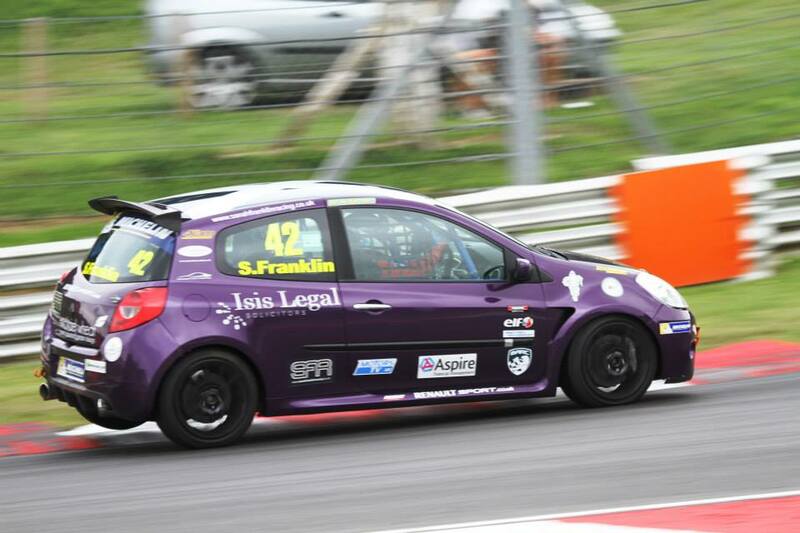 Sarah has clinched 3rd in the Michelin Clio Cup Road Series in 2014. There was lots of action at the Snetterton Round of the Michelin Clio Cup Road Series! An up and down weekend for an up and down circuit! The podium became a reality for Sarah at the Leicestershire circuit. At Round 2 of the Michelin Clio Cup Road Series, it wasn't just the circuit that had it's ups and downs. Sarah took part in the first Autotest of the year last weekend. Sarah was racing at the famous Birkett 6 Hour Relay Race at Silverstone last weekend. 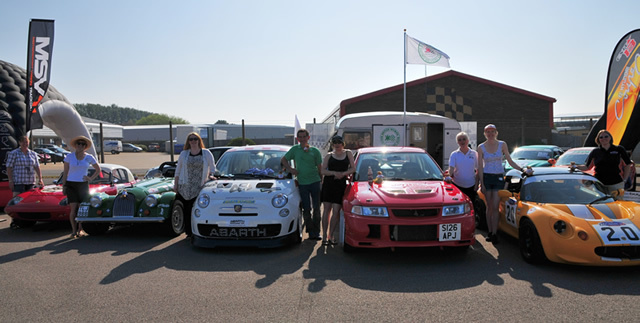 Sarah was back in action in her Abarth 500 Assetto Corse last weekend when she was invited to be part of a team racing in the British Heritage 4 Hour Relay Race at Snetterton. Sarah became a world record holder at the weekend on a bouncy castle! Sarah was asked to take her race car to the Go Motorsport Event at Silverstone. Sarah was invited along by Cannock and District Car Club to try out an Autotest at the weekend. 2012 was a rollercoaster - but championship winning - year for Sarah. Here's her review of her racing year. Sarah had a very successful weekend at Rockingham in the Dunlop Production Touring Car Championship. The provisional timetable for the Rockingham Round of the PTCT has been announced. Sarah had a go in a Ma5da this weekend at Rockingham - but not quite in the car she expected! Sarah had a fantastic weekend at Thruxton and took home the Dunlop Production Touring Car Class B championship. Sarah went along to the Silverstone Classic this weekend for a day of cars, cars and more cars! This weekend saw the PTCT move on to Snetterton in Norfolk. This would be on the new 300 circuit which Sarah had never been on in the Abarth! The timetable for the Snetterton round of the Production Touring Car Trophy has been announced. Brands Hatch was to prove a bit of an 'up and down' weekend for Sarah, much like the undulations of this famous Kent Circuit! The provisional timetable for Round 3 of the Production Touring Car Trophy at Brands Hatch has been announced. Sarah took some time out of her busy schedule to attend the Auto Italia event at Brooklands this weekend - and also took the opportunity to do a bit of karting with some fellow Abarth enthusiasts! A Busy Race Weekend at Donington! Sarah had one of her busiest Race weekends at Donington last weekend - and came away with 3 class wins in the Production Touring Car and one very interesting 4Two Cup race! The Timetable for the second round of the PTCT has been announced! Sarah Franklin Racing is pleased to announce a new sponsor for the 2012 season, TMC Motorsport. Sarah had the perfect opening round at Oulton Park with a maximum points haul of two class wins and two fastest laps! The provision Timetable for the Oulton Park round of the Production Touring Car Championship on the 24th March 2012 has been announced. Sarah has today announced that in 2012, she plans to take on the Dunlop Production Touring Car Championship. BSC member scoops Scalextric prize! 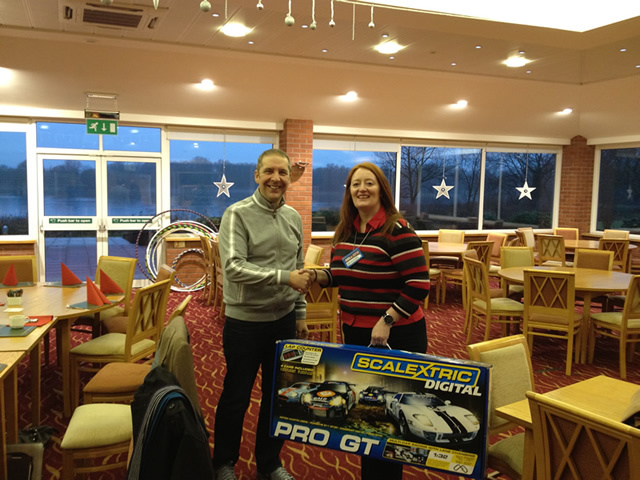 One of the members of Sarah's Business Supporters Club scooped a fantastic Scalextric set as a thank you for their support in 2011! Sarah had an excellent time at the 2012 Autosport International Show at the Birmingham NEC! Sarah will be at the Autosport International Show at the Birmingham NEC on Thursday 12th - Sunday 16th January 2012 - and the details for the Goldstar Presentation have also now been announced! Sarah receives BWRDC Gold Star Nomination! Sarah today received notification that she has been nominated for the prestigious BWRDC Gold Star of 2012. After a horrendous accident at Silverstone during the qualifying of the 4Two Cup, Sarah is now well on the road to recovery. Sarah's hope to overhaul David Moore's lead in the 4Two Cup at the weekend came to a dramatic halt. The Timetable for the fourth round of the 4Two Cup has been announced. This will be at Silverstone in Northamptonshire, Sarah's local circuit. Quite a come back at Snett! Sarah's weekend at Snetterton for the 4Two Cup was a tale of ups and downs but certainly full of excitement! Having never raced on the new Snetterton 300 circuit, it was going to be an interesting days racing! The Timetable for Round 3 of the 4Two Cup this weekend at Snetterton has been finalised. The second round of the 4Two Cup was at one of Sarah's favourite circuits, Castle Combe in Wiltshire, although the last time she'd raced there was some years ago in the Ginetta G20. There was also a change of tyres for the Smart Brabus from Dunlop Direzza's to Hancook road tyres to mix things up a bit! Sarah spent Thursday 14th July at the Brooklands Suite at Silverstone for the final of the Silverstone Innovation Centre Design Challenge. The timetable for Round 2 of the 4Two Cup at Castle Combe on the 23rd and 24th July has been announced. Sarah was given the opportunity to get back into her Abarth Assetto Corse this weekend at Rockingham Motor Speedway as part of an invitation class in the Dunlop Production Touring Car Championship. Sarah has been given the opportunity to get back into her Abarth this weekend when she will race in the Dunlop Production Touring Car Championship. Sarah took her first win in the inaugural race of the 4Two Cup at Donington this weekend! She followed this with a 2nd place in Race 2, along with a pole position and fastest lap along the way! The timetable for Round One of the 4Two Cup has now been announced. Sarah is pleased to announce that she will be taking part in the first two rounds of the new-to-the-UK 4two Cup in 2011. Unfortunate news was released this week - the Trofeo Abarth 500 GB Championship will not happen in 2011. Sarah went along to Donington Park on the 2nd March to test the Brabus Smart Race Car which has been specially prepared for the Smart 4Two Cup this year. Sarah went along to her local radio station, BBC Radio Northampton to be on the Monday Nights Sports Show on the 28th February. 2011 Design Challenge kicks off! Sarah this week joined her fellow Judges for the first stage of the 2011 Silverstone Innovation Centre Design Challenge. 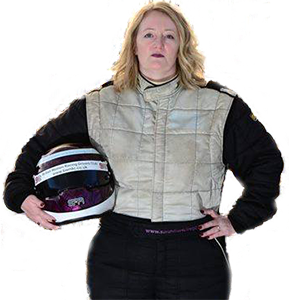 Sarah's driver profile has today been highlighted on the website of the Trofeo Abarth 500 GB Championship. Sarah was interviewed by John Sims from the Porsche Club GB whilst at Autosport. Sarah had a great four days at the Autosport International Show at the NEC in Birmingham over the weekend. The 2011 Trofeo Abarth 500 GB Championship Calendar was announced today at the Autosport International Show at Birmingham! Sarah will be at the 2011 Autosport International Show at the Birmingham NEC. I just wanted to take this opportunity to wish everyone a very Merry Christmas and Happy New Year! Sarah's Track Day Car in first outing! Sarah had the opportunity to take her new Track Day car, an Abarth Esseesse to Rockingham on Friday. Supercar Saturday at Castle Combe! This weekend, Sarah went along to Castle Combe to support The Stroke Associations annual event, Supercar Saturday. Sarah was pleased to discover that she has ended 2010 in 9th place of the Zing Trofeo Abarth 500 GB Championship. This was despite not being able to make the last round at Monza due to illness. Sarah had a fun filled packed weekend at Brands Hatch, with the Trofeo Abarth being a support race for the UK round of the DTM championship! 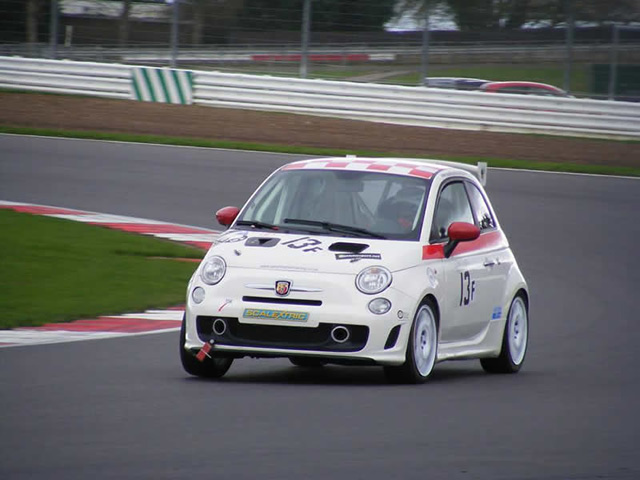 Sarah came home with a brace of top ten finishes from the fifth round of the Zing Trofeo Abarth GB Championship at Silverstone last weekend. Rounds 9 and 10 of the Zing Trofeo Abarth GB Championship will take place at the Silverstone Classic weekend on the 24th - 27th July 2010. After having to miss the last round at Cadwell Park, Sarah's return to the Zing Trofeo Abarth GB Championship at Snetterton this weekend was marked with its ups and downs! Sarah will again be trading in her racing slicks for trainers when she runs around the Silverstone GP circuit this week in aid of Cancer Research. Sarah is again, for the fourth consecutive year, supporting the Silverstone Innovation Centre Design Challenge. This year, it looks like it will be bigger and better than ever! 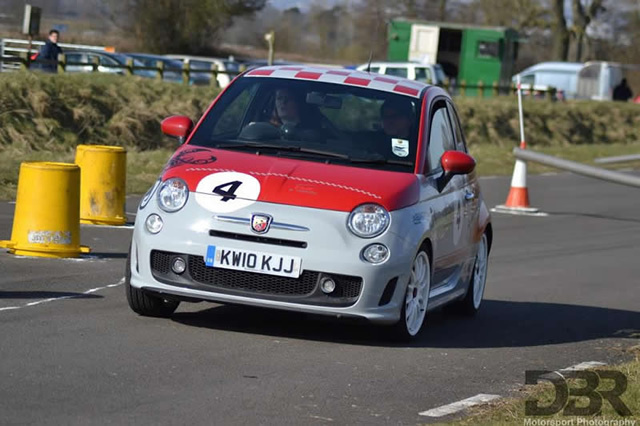 This weekend was Round 2 of the Zing Trofeo Abarth 500 GB Championship - but it didn't go quite to plan for Sarah. Sarah is pleased to announced that she has formed a strategic partnership with Scalextric! Sarah will be competing in the second round of the Zing Trofeo Abarth 500 GB Championship this weekend at Silverstone in Northamptonshire. Sarah had a great weekend at Oulton Park in Cheshire for the first round of the Trofeo Abarth 500 GB Championship and achieved points finishes in both races. Sarah is extremely pleased to announce that during her 2010 season, she will be supporting the Warwickshire and Northamptonshire Air Ambulance. Two tracks, two days and lots of testing done! A gardeners world ... with some cars thrown in! Sarah was invited out to lunch with Alan Titchmarsh yesterday. Surprisingly, she discovered that Alan really likes his cars - albeit old ones! Sarah attended the MSA's Women in Motorsport event at Silverstone today and was joined by lots of other ladies who are involved in motorsport in many, many ways. Timetable for First Round announced! The timetable for the first round of the Zing Trofeo Abarth 500 GB Championship has been announced. 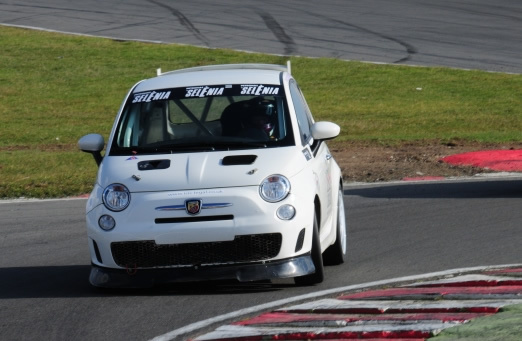 Sarah today tested her new Abarth race car for the first time at Snetterton. Sarah attended the annual awards dinner of the British Women Racing Drivers Club on the 20th February at the beautiful Nailcote Hall in Warwickshire. Sarah collects new race car for 2010! Sarah today took delivery of her new race car for 2010. The Eggheads show that Sarah recorded at the BBC last May will be aired on the 24th February 2010 on BBC2 at 6 p.m. The BWRDC 2010 Gold Stars website is now up and running. Sarah will again be exchanging her race boots for running shoes when she undertakes the Race for Life in support of Cancer Research UK. 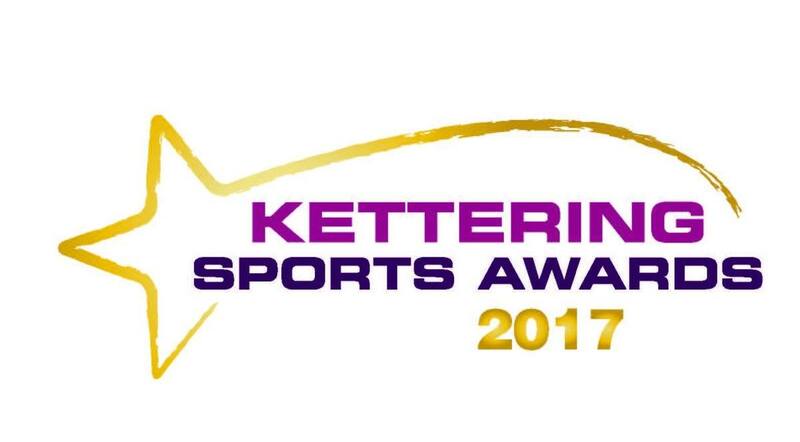 The 5 km race will take place around the famous Silverstone GP circuit in Northamptonshire on Wednesday 9th June 2010. The final calendar for the Trofeo Abarth 500 GB Championship has now been announced. Sunday 17th January - the final day at Autosport! The two public days at Autosport International are always hectic! Saturday 16th January was also the day of the BWRDC Gold Star awards for which Sarah was a nominee in the Club Category for the second year running. After an exciting day of setting up, Sarah was ready and raring to go for the show! 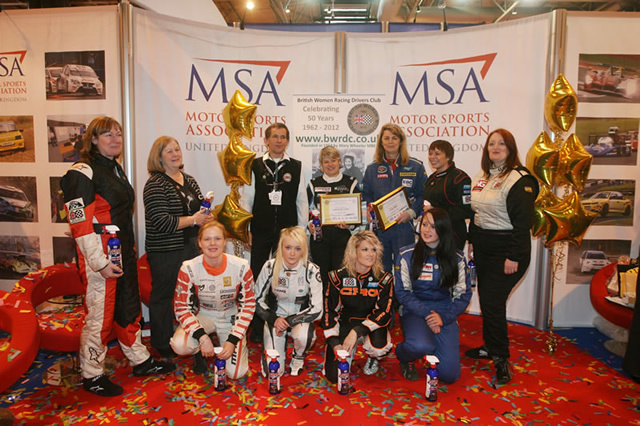 As a committee member of the British Women Racing Drivers Club, Sarah was involved in the organisation of their stand at Europes biggest car show, Autosport International. Sarah will be attending all four days of the Autosport International Show at the Birmingham NEC this week. Just a quick note to wish everyone a Merry Christmas - and a thank you to all those who have supported me throughout 2009. The 2010 provision calendar for the Trofeo Abarth 500 GB Championship has been announced. With races in both the UK and Belgium, supporting such weekends as the British Superbikes and the World Touring Cars, there's sure to be lots of action on offer! Sarah receives Second Gold Star Nomination! Sarah today received notification that she has been nominated for the BWRDC Gold Star award for the second year running! Dave Sinclair from SinVision prepared a promotion video for Sarah during her time with the Lunar Racing squad in Britcar earlier this year. Sarah and Dave - with Steady Cam! Sarah announces plans for 2010! Sarah has recently announced that, for 2010, she intends to compete in the new-for-UK series, the Trofeo Abarth 500 GB Championship. After a successful year of racing in Europe, the series will be coming to the UK, racing the race spec'd Fiat 500 Abarth Assetto Corse. This week, Sarah went along to Whittlebury Hall near Silverstone to have lunch with Strictly Come Dancing's Anton Du Beke. Sarah takes on the Eggheads! Earlier this year, Sarah went along to the BBC Studios in London to appear on the famous Quiz Show 'Eggheads' with some fellow British Women Racing Drivers Club members. The Episode is due to be aired in the next few weeks. Sarah was invited to speak at the annual luncheon of the East Midlands Institute of Directors last week at the famous Nottingham cricket ground at Trent Bridge. Sarah enters the Dragon Den once more! For the third year running, Sarah was involved in the Silverstone Innovation Centre Design Challenge. Sarah acted as one of the Judge's in the 'Dragons Den' where the students from various schools over the Country presented their new and innovative designs. Sarah gets her own Scalextric car! Sarah was yesterday presented with her very own Scalextric car! Sarah was, this weekend, invited to the Lotus Silverstone Launch at the Northamptonshire circuit. Sarah was this week invited to take part in the FSB Karting endurance race at Whilton Mill in Northampton - and walked away with a 2nd place to boot! Double Podium for Sarah at The Rock! Sarah and the Lunar Racing team headed off to Rockingham Motor Speedway this weekend - and came away with a double podium! The Britcar Production Championship moved to Rockingham this weekend thanks to the support from several members of the Leicester Business Club, including Craig Bunday, the Chief Executive of the Leicester Business Club itself. The Silverstone round of the Britcar Production Championship is to be aired on Motors TV. The timetable for the Britcar Production Championship at Rockingham on the 2nd and 3rd May has been announced. Sarah and the Lunar Racing Team had a very successful day of testing at Snetterton on Wednesday. Donington round of Britcar cancelled! The Britcar round at Donington which was due to take place on the weekend of the 1st-3rd May has today been cancelled - and has been replaced by Rockingham on the same date. Sarah and the Lunar Racing team visited the Leicester Business Club on the 6th April 2009. After a difficult start to the weekend, Sarah, her co-driver Gail Hill and the Lunar Racing Team left Silverstone after their first ever Britcar Production Championship race with a podium finish! Sarah got her first opportunity to take out the MG ZS on track at Bedford on the 14th March. A successful day at Kemble! Sarah got her first taste of the 2.5 V6 MG ZS today when she went along with the Lunar Racing Team to Kemble Airport in Gloucestershire for the Britcar Datalogger Test Day. Sarah will be racing in the Britcar Production Championship in 2009 in an 2.5 V6 MG ZS run by Bedford based team, Lunar Racing. Bad news ... and some good! Sarah's hopes to race in the Porsche Carrera Cup are having to go on hold until 2010 due to budget issues. It's a tale that, unfortunately, many other drivers are having to face in this difficult financial climate. The good news, however, is that Sarah will now be taking part in the Britcar Production Championship in 2009 - more details to follow! Sarah to take on the Eggheads! Sarah will be taking on the BBC's formidable 'Eggheads' next month as part of a team put together for the British Women Racing Drivers Club! Sarah attended at the Innovation Centre at Silverstone today for the pre-judging of the Silverstone Innovation Centre Design Challenge 2009. Sarah attended Porsches 'Fit to Race'Workshop yesterday, 24th January at their fantastic Driving Experience Centre at Silverstone. Sarah was present at the Autosport International Show at the Birmingham NEC from 8th until the 11th January 2009 on the British Women Racing Drivers Stand with the Porsche GT3 that she hopes to be racing this year in the Porsche Carrera Cup GB. The BWRDC Gold Star results were announced on Saturday at the Autosport International Show in Birmingham. The time, date and place for the BWRDC Gold Star presentation has been announced. Just a quick note to wish everyone a very Merry Christmas and to say a big thank you to all those who have supported me through 2008. Sarah today received notification from the Chairman of the British Women Racing Drivers Club, Helen Bashford-Malkie, that she has been chosen as a nominee of the new BWRDC Gold Stars. Sarah will be attending the Autosport International Racing Car Show at Birmingham NEC on the 8th through to the 11th January 2009. Sarah has had a logo designed for her by graphic designer, Clive Francis. Sarah attended at the famous Leicester Tigers Rugby ground this morning to give a presentation to the Institute of Directors. A thrill packed weekend at Donington for Sarah! This weekend at Donington marked Sarah Franklins second entry to the Texaco Havoline Ginetta Championship this year and her first time to try out the wet tyres! As ever in motorsport, you have to take the rough with the smooth and Sarah had to take the rough during a difficult time at Silverstone this weekend. After successful weekends in the Ginetta Club Championship at both Cadwell and Snetterton this year, Sarah is going to be racing in the main Texaco Havoline Ginetta Championship round at Silverstone on the 16th and 17th August 2008 in her G20. She will be run by her usual team, Reflex Racing GB. Sarah's Carrera Cup debut ends with a bang! The 11th July 2008 marked my step up to full blown sports car racing. I had been invited by Porsche GB to race their guest car in the Porsche Carrera Cup at Snetterton. Here is my diary from the weekend. Sarah in the Dragons Den again! On Friday 16th May, Sarah attended at the Silverstone Innovation Centre Design Challenge 2008 final as a Judge. This is the second year that Sarah has supported this event and this year saw two teams of Judges, one headed by Renault F1’s Pat Symonds and the other by Rally co-driving champion Nicky Grist, put the students through their paces! Sarah Takes to the Sky! Sarah today took the skies behind the controls of a two seater Puchacz training glider! Another Karting Victory for Sarah! Sarah was invited to take part in a two hour endurance race at the Whilton Mill karting circuit in Northampton on the 21st May 2008. Sarah shall be racing in the Porsche Carrera Cup at Snetterton on the 12th and 13th July. A brace of 4th's for Sarah at Snetterton! Snetterton was the host of Round 2 of the Ginetta Club Championship at the May Bank Holiday weekend. The 2008 Silverstone Innovation Centre Design Challenge final will take place at Silverstone on May 16th . Sarah was invited to speak at the College of North East London in Tottenham on the 15th March for an event held by Haringey Council entitled ‘Phenomenal Women’. Sarah arrived at Cadwell on Saturday morning, 5th April and it was cold and wet! On the 14th March, Sarah attended the Women of Achievement Awards 2008 at the home of Leicester City Football Club, the Walker Stadium. Silverstone Innovation Centre 2008 Design Challenge kicks off! Sarah attended the pre-judging of the Silverstone Innovation Centre Design Challenge 2008 today. Sarah is, once again, trading in her four tyres for a pair of trainers to run the 5km Race for Life to raise funds for Cancer Research UK. Sarah attended at the Leicestershire and Northamptonshire Business Network International (BNI) annual breakfast meeting on Tuesday 5th February - and picked up an award for her efforts and contributions to the local BNI in Melton Mowbray! Sarah is looking to be on the grid in 2009 in the top sportscar championship in the Country, the British GT Championship! Sarah has announced that she will be racing in the 2008 Texaco Havoline Ginetta Championship. As Charles Dickens said in A Tale of Two Cities: ‘It was the best of times and it was the worst of times’! Sarah arrived at Silverstone on a cold and damp Sunday morning for the first two rounds of the Ginetta Winter Series. Unusually, the qualifying and both races were all on the same day so there really was no time for errors! Sarah has announced that she will be racing with Reflex Racing GB in the Texaco Havoline Ginetta Winter Series. The winners of the Silverstone Design Challenge joined Sarah at Rockingham on Sunday 30th September. Sarah was back in the driving seat of her Ginetta race car at the weekend after nearly a year long sabbatical to set up her legal practice, Isis Legal Ltd.
Back in the Driving Seat! After her sabbatical from racing to set up her legal practice, Isis Legal, Sarah was finally back in her Reflex Racing Ginetta this week. Sarah went along to Silverstone today and ended up on the grid – but unfortunately not in a car! On the 1st August, Sarah was invited along by her local business networking group to try her hand at clay pigeon shooting at Orston Shooting Ground in Leicestershire. Sarah gets The Eye ! Sarah will be back on the radio on Sunday 6th May at 11.30 a.m.
Sarah has just announced that in May 2007, she will be starting her own legal practice, Isis Legal. This is a very exciting time for Sarah but means that, unfortunately, the racing will have to go on hold for a short time. Sarah is pleased to announce that throughout 2007, Sarah will be sponsored by The Adults Only Club, a web-based business which supplies lingerie, vintage underwear, wigs, hosiery, shoes, sandals, boots and accessories. Sarah attended the British Women Racing Drivers Club Awards Luncheon at Rockingham Motor Speedway in Corby today – and, to her complete surprise, was awarded the Rabbit Trophy for her contributions to the club. Race for Life Take 2! After successfully exchanging her race boots for running shoes in 2006, Sarah has again entered the Cancer Research UK’s 5 kilometre Race for Life in 2007. Sarah once again joined her local Business Network International group from Corby in a team endurance event at GP Karting in Northampton on the 9th February 2007, taking on teams from BNI Chapters Kettering, Collingtree, Sixfields and Welland. On Thursday 11th January, Sarah spent the day at the Autosport International Show at Birmingham NEC viewing the newly launched race cars and having meetings about her plans for 2007 and beyond. Sarah gave an interview on BBC Radio Oxford today at 2.30 p.m.
Sarah was invited by Ben Kench, the MD of ABC Training and Developments to their Annual Awards Ceremony on Friday 1st December. Sarah competed at the famous 6 hour Birkett Relay Race at Silverstone on the 28th Ocotber. Sarah has been invited to be a judge for the Silverstone Innovation Centre 2006/7 Design Challenge. Saturday October 28th 2006 Sarah will be racing in the famous Birkett Six Hour Relay Race at Silverstone on the Saturday 28th October 2006. Sarah has been invited to attend the launch of the new conference facilities at Silverstone Innovation Centre on the 21st September 2006, when the facilities will be officially opened by Damon Hill. You can be sure of Shell! Sarah was invited along to Snetterton in Norfolk on the 23rd August 2006 to give passenger rides in her Ginetta G20 to employees and VIP guests of Shell for their launch of a new and improved performance fuel, V-Power. Off the track, Sarah had another first this month – her first public performance with her fellow band members, Jan, Haydn and Jim aka ‘The Network’! Sarah today gave an interview to Alistair Rendall at Northants 96 to talk about women in motorsport, what she’s up to at the moment and her long term project of an all British Womens team for the Le Mans 24 hour race. Sarah will be appearing on ‘The Good Day’ show on Monday 3rd July 2006 to talk about her racing and plans for the future. It will be on Legal TV’s channel 885 at 10 a.m. so be sure to catch it or record it! Sarah went along to Silverstone Race Circuit for a race unusually not involving any cars today! She was taking part in the ‘Race for Life’ in aid of Cancer Research UK. Sarah joined her local Business Network International group from Corby in a team endurance event at GP Karting on the 9th June 2006, taking on teams from BNI Collingtree and a joint Corby/Weldon entry. Sarah will be exchanging her racing boots for running shoes and four tyres for two feet when, on the 14th June 2006, she runs the 5km ‘Race for Life’ around Silverstone race track in aid of Cancer Research. Sarah had her first test in the newly re-built (and completely different coloured!) car at Snetterton today. It was, unusually for the Norfolk track, bright and sunny for the whole day! Sarah began her 2006 testing in her Reflex Racing Ginetta G20 at Oulton Park this week – and it was on a very, very wet day! Sarah today attended the British Women Racing Drivers Club Annual Awards Ceremony which, this year, was held at the Heritage Motor Centre in Gaydon, Warwickshire.